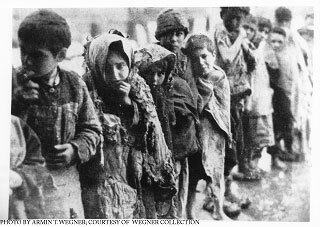 The Armenian Genocide claimed the lives of 1.5 million men, women and children between 1915 - 1923. Through this Information Quest activity, students will learn about the history of the Armenian Genocide, learn to identify the differences between sources of information on the same topic, and recognize the value of multiple perspectives in the learning process. Students will engage with testimony using a built-in tool that enables each to construct a word cloud, a fitting title, a meaningful quotation, and a personal response to reflect individual feelings and perceptions about the story.